If you worry that your SD cards just can't keep up with the pace, fret no longer. 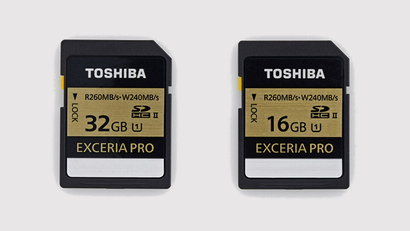 Toshiba has the world's fastest SD cards, in the shape of the new Exceria Pro SDHC series, to deal with your ridiculous data acquisition needs. Designed for top-end cameras — there's no point using these in anything cheap — the Pro SDHC cards come in 16GB and 32GB flavours, boasting write speeds of 240MB per second and read speed of 260MB. That is a lot of MB per second. The cards complement the Exceria Pro series Compact Flash cards that debuted earlier this year. There's currently no pricing information available, but you can expect that even the 16GB card will be priced insanely. So, it's probably no bad thing that the Pro range will be joined by a plain old Exceria SDXC range, with capacities of 32GB or 64GB, capable of writing at speeds up to 120MB per second. (They'll also be able to read at 260MB per second, like their faster siblings).